Hooray! The time for bank holiday, spring sunshine and chocolate is upon us! Hopefully you are getting some time off this weekend to enjoy friends family, sleep and all things oval shaped. Easter seems to have crept up on me this year, I am still in shock that it is actually April and Good Friday! I love this time of year though, a chance to celebrate, to rest, to have a roast and to remember that thousands of years ago Love invaded this earth and made a way for peace, fun, joy and healing to rest with us. One miracle years ago means we can to witness many miracles today. Now that is a reason to celebrate! But Easter is mainly about chocolate. You may totally disagree with my God wafflings but we can all agree that this time of year is another awesome opportunity to indulge once more in the good stuff. Now I am all about chocolate and I would hate to think that anyone was feeling deprived this weekend due to there desire to lose weight, food allergies, or pursuit of increase health and energy. I personally wont be eating any shop bought eggs but will be enjoying a host of homemade goodies. Growing up easter egg nests were a staple in our house this time of year. Maybe its because our house was always full of people (4 kids, plus dogs, lodgers and random strays) and food went fast so grabbing some all bran or rice crispies and mixing in melted chocolate is a recipe for success. But being grain free I wanted to make some super naturally healthy versions that were gluten/grain free, could be diary free and are actually going to do your body good. I have been chomping these since I returned from New York and they are a scrumptious protein packed, antioxidant filled Easter treats! There is so much GOOD stuff in these metabolism boosting fats in the coconut oil, zinc in the pumpkin seeds, healthy protein seeds, coconut and butter, oil, plus loads of anti ageing antioxidants in the goji berries and cocoa. These truly are SUPER Easter Treats! Also I have rounded up some of the best other recipes I have seen floating around on pinterest and on the blogs I love so scroll down tot he bottom to get further Easter-spiration ! 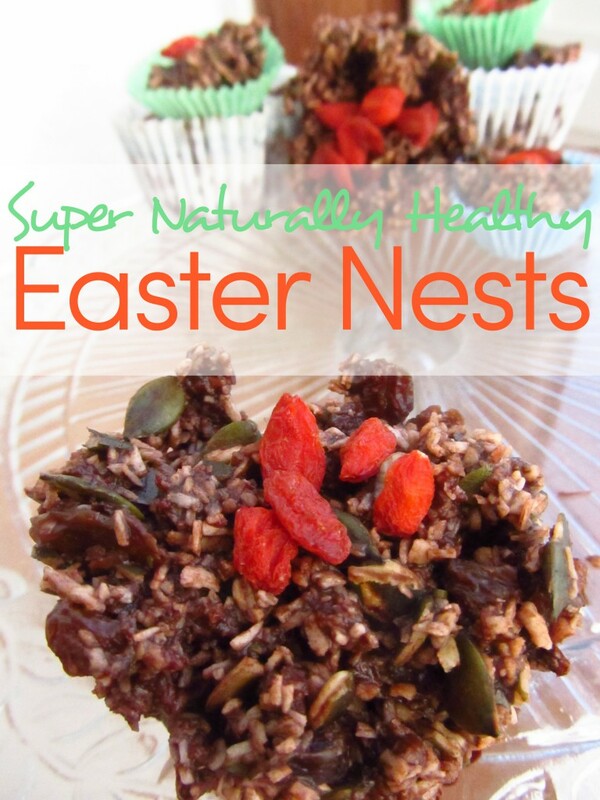 Easter chocolate nest that are tasty and super chocolatey but jam packed with super foods. Gluten, grain and the option of being diary free! Place coconut and pumpkin seeds in a food processor and pulses for about 30 sec until the pumpkin seeds look more nest like. Place the coconut oil, butter, vanilla essence, coconut sugar, honey, salt, cocoa powder in a glass bowl over some boiling water and melt. Then mix all the ingredient together until everything is chocolate coated. Then place 1 tbsp into muffin cases and shape into a nest shape. Decorate with dried berries or mini eggs if you so wish! Feel free to use another seed other than pumpkin seeds, and all butter instead of coconut oil. This recipe is a great one for experimenting - apricot, dates, sunflower seeds and figs would all taste good in this! Top 3 Easter Tastic Recipes! Homemade Organic Dark Chocolate – by yours truly! Chocolate Peanut Butter Cups – love these! Easy Cadbury Creme Egg – trying this out! 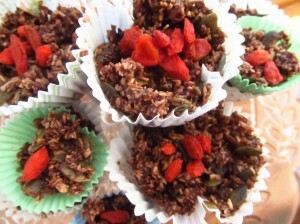 Raw Cacao & Walnut Truffles – A grown up but awesome easter treat! If you like this recipe then why not share it with your friends on facebook or twitter, pin it on pinterest and together we can make this world a more super naturally healthy place to be! How will you be spending you Easter weekend?